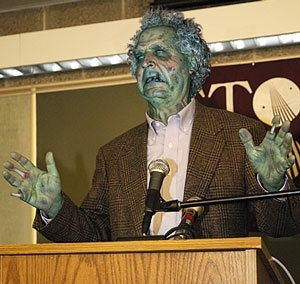 Institutes argue over zombie diet, brains or body? Recently, the late Dr. Albert Rossum, director of the O'Bannon Institute For Postmortem Nutritional Studies, based in Stony Brook, NY, recommended an all-brain diet, going against conventional, long-standing wisom. 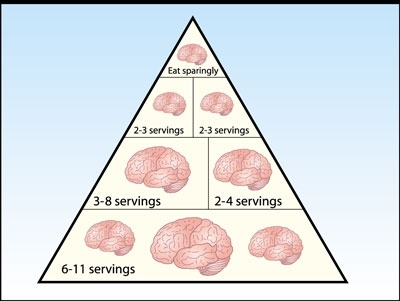 Said Dr. Rossum, "Our research indicates that live human brains are not merely the cornerstone of a healthy diet; they are, in fact, the only food an active adult zombie should consume at all. A daily three-pound serving of brains supplies all the vital sugars, neurons, and ganglia essential to promoting zombie fitness and slowing the decomposition process." Dr. Rossum's findings were dismissed by the late Dr. Vincent Peters of the Romero Foundation for Zombie Health. "The O'Bannon Institute's plan is a reckless fad diet. Five servings each day from the neurosensory group, made up of the brain, spinal column, and nervous system, as well as from the vascular, digestive, and pulmonary groups, are the best way to maintain robust zombie health. It is an established fact." Rossum responded, "There is still ample room for dietary variety in this plan. One day, you might make a spicy South Of The Border treat of a Mexican person's brains. The next, you could enjoy the Far East taste sensation of an Asian. There are so many different kinds of heads to tear open, there's no reason ever to get bored." Read the full story at The Onion.